Ventura, California.........Both nights of the 77th running of the "Turkey Night Grand Prix" from Ventura Raceway will be LIVE on http://www.SpeedShiftTV.com/. 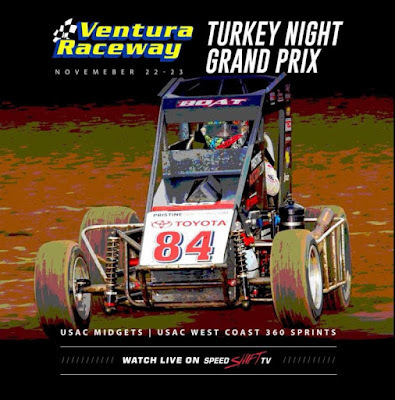 "Turkey Night" from the seaside oval begins Wednesday, Nov. 22 with a full program featuring the USAC West Coast and VRA Sprint Cars, plus an open practice for midgets. The following night, Thanksgiving Thursday, Nov. 23, will once again include the sprint cars as well as the prestigious, 98-lap midget race. At press time, a hefty field of 52 drivers have entered for the famed midget race, which includes heavy hitters such as past "Turkey Night" winners Dave Darland (2007 & 2013), Kyle Larson (2012 & 2016), Christopher Bell (2014) and Tanner Thorson (2015), plus 2017 USAC National Midget winners Justin Grant, Brady Bacon, Tyler Courtney, Michael Pickens, series point leader Spencer Bayston and Chad Boat as well diverse racing standouts Brad Sweet and Chase Briscoe among many others. The Sprint Car field is stacked as well with two handfuls of drivers preparing for double-duty by competing in both divisions. Those drivers are eligible for the Automotive Racing Products' $50,000 bonus that goes to the driver who can win both the midget and sprint feature on Thursday night. Cars are set to hit the track around 3:30pm Pacific at Ventura Raceway both nights. As always, you can watch every USAC race, including "Turkey Night," on demand, a day following the event, at http://www.Loudpedal.TV/.